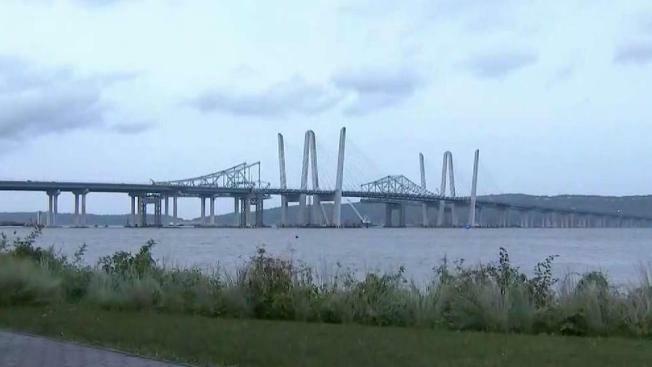 Fears that the old Tappan Zee Bridge could collapse caused the entire river under the bridge to be closed and the opening of a new span of the Gov. Mario M. Cuomo Bridge to be delayed. The problem began with a loud "pop" around 5 p.m., said Terry Towle, president of Tappan Zee Constructors. That's when engineers noticed problems with two joints on the old bridge. Experts are concerned the bridge could slowly fall into the water and into the new span, Towle said. The discovery saw the entire Hudson River under the Tappan Zee and Mario Cuomo bridges closed to maritime traffic about midnight, officials said. The waterway is expected to reopen at sunrise Sunday, according to the Coast Guard. Then the waterway will only be open during daylight hours until the area is deemed safe by marine investigators. The planned opening of the second span of the Gov. Mario M. Cuomo Bridge was also delayed due to collapse fears. "In continued disassembly of the old Tappan Zee Bridge last night, a potentially dangerous situation developed where a piece of the old bridge has become destabilized and could fall," New York State Thruway Authority spokesman Matthew Driscoll said in a statement. "Given its proximity to the new completed span, out of abundance of caution, motorists will remain in the current traffic configuration until a thorough evaluation by Tappan Zee Constructors is complete," he said. The second span "is finished and ready to open to traffic as soon as the Thruway Authority is assured there is no risk to the new span," he added. Westchester-bound traffic was supposed to transition to the Gov. Mario M. Cuomo Bridge's second span overnight Friday. Cuomo's primary rival Cynthia Nixon was quick to release a statement calling for an investigation into the potential collapse. "A ribbon-cutting ceremony should not have been held if the bridge span was not safe yet," she said. "There are real, reasonable questions about whether this bridge span opening was accelerated to aid the Governor's campaign."